Transsolar helped shape the architectural design to provide optimum daylight quantity, quality and distribution; balancing a dynamic spatial experience with art conservation requirements in top floor gallery spaces. 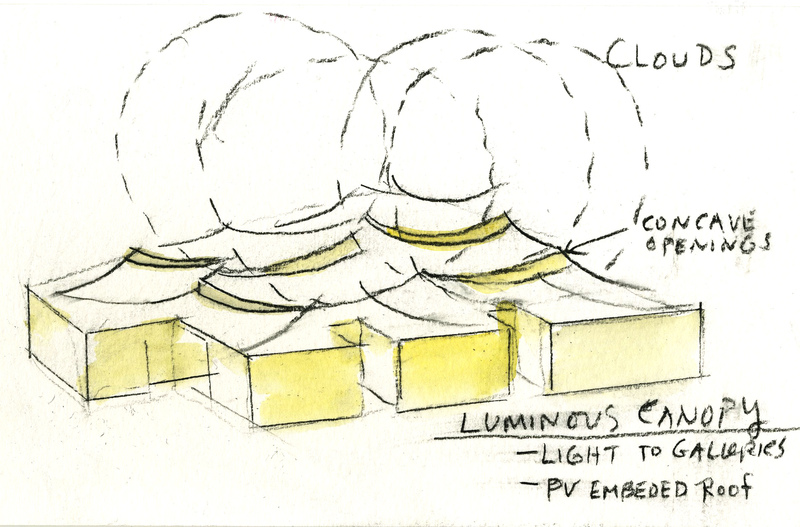 Gallery orientation, daily and seasonal variation of the sun position, and cloud cover were considered while evaluating various geometries and materials with to fine-tune the daylight design. The ventilated double façade “cool jacket” of translucent and curved glass provides both uniform daylight and control of solar heat gain. Transsolar evaluated and optimized the spectral properties of this complex façade buildup. This process required negotiation between the aesthetics of the façade and the physical properties of the glass buildup to reduce solar loads while maintaining the quality of the daylight.